NSW’s ability to attract international students is crucial for our economy given it is our largest services export and worth over $6.9 billion to the NSW economy every year. In 2014 StudyNSW was established to grow the state’s international education sector and improve international students’ experience while studying in NSW. The good news is that international student enrolments are growing. Many students are coming from China, but also from the rest of the world, including major and emerging economies. StudyNSW delivers projects with its partners in the education sector that strive to improve students’ experience. Last night the Interchange program culminated in a Gala Pitch Event in Sydney. 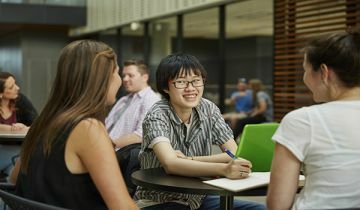 Interchange is about encouraging entrepreneurialism in international students, to help them get jobs in Australia and abroad once they have completed their study. After a three week intensive course complete with mentors, and workshops with successful entrepreneurs, international students got the chance to pitch their business ideas to fintech hub Stone & Chalk. In a colourful display of national pride, the World Biggest English Lesson took place earlier this year on Bondi Beach with students from over 100 countries participating. It was a Guinness World Record and the images of Sydney’s iconic Bondi Beach beamed around the globe to prospective students. StudyNSW has also supported Global Scope, a partner project with edutech startup Intersective that places international students in work experience roles in the public sector. NSW government agencies tasked the students as consultants to solve ‘real-life’ business problems over six week placements. Projects such as these are invaluable for students to get the work experience they need in a competitive jobs market. Ultimately, StudyNSW works to enrich the lives of both international students and NSW citizens by improving international students’ experience through these programs, creating strong student ambassadors for the state and helping to attract more students to NSW.